Moving coil Instruments are protected from damage or breackage under adverse conditions due to spring loaded jewel & pivot system. These instruments are free from external magnetic field influences because of centre magnet system & are “CE” certified. Voltmeters are made up to 600V for direct connection and up to 1200V with external multiplier with sensitivity 1000 ohms/V. Higher sensitivities are available. Scale printed for other variables viz. Speed, Temp, pH, kW, kVAR, Hz or cos ø etc. can be supplied on request. Ammeters with internal shunts are available upto 30 Amps and for higher currents up to 12000 Amps use external shunts of 50mV, 60mV, 75mV etc. OPERATING VOLTAGE : 50mV to 600V. OPERATING CURRENT : 100uA TO 30A. & Above 30A external shunt. DIELECTRIC TEST : 2kV RMS for 1 minute. OVERLOAD SHORT TIME : 2 times VN/10 times IN for 5 seconds. 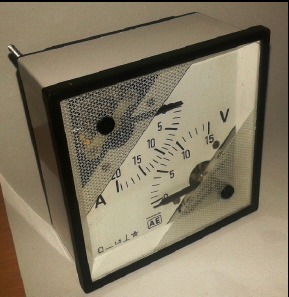 1)Type 2) Model 3) Operating Voltage / Current 4) mV in case of Ammeter with external shunt.